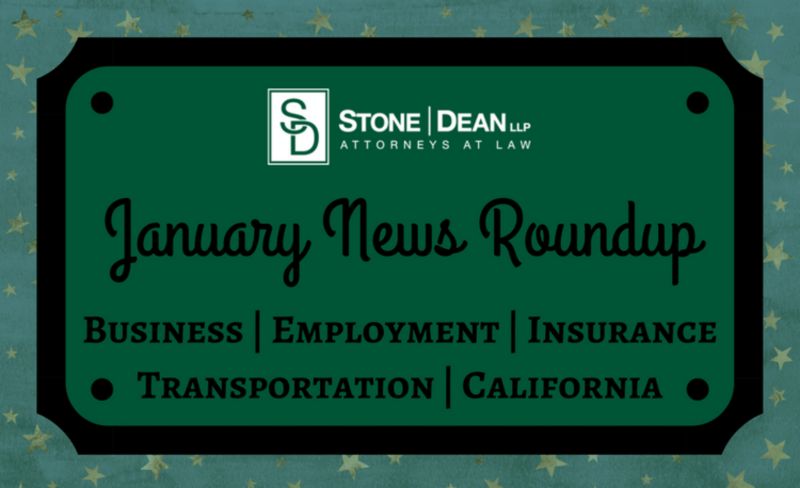 All the best news in California, Business, Employment, Insurance, and Transportation for January, 2018. The Supreme Court is being asked to revisit a 1992 decision to not enforce sales taxes on online purchases. The attorneys arguing for the law to be overturned claim that billions of dollars in tax revenue have been lost as a result of the boom in online shopping. California may stop allowing those accused of crimes to get out of jail on bail. The system has been criticized as unfair to those with low income. The California Treasurer’s office has launched a new website to aid business owners in finding incentives to grow their businesses. It is the Treasurer’s hope that the user-friendly website will aid California business owners in finding and applying for incentive opportunities. The Obama administration’s net neutrality rules have come to an end, but in California, the fight isn’t over. Lawmakers are continuing to work towards reinstating net neutrality, a measure they say will protect consumers. The Eagles, a popular American band, sued a Mexico-based hotel named “Hotel California”, claiming that the hotel was attempting to monetize on the popularity of their most famous song. The band and the hotel have chosen to settle the lawsuit, though the terms of the settlement have not been made public. Grumpy Cat, A.K.A. Tardar Sauce, prevailed in a copyright infringement case against a coffee company. Grumpy Cat skyrocketed to internet fame after a photograph of his permanent frown was posted on Reddit and has appeared in memes, advertisements, and television shows. Google is facing a wage inequality lawsuit from female employees who claim the company violated the California Equal Pay Act, which prevents employers from basing an employee’s salary on salary history, and prohibits them from asking about a prospective employee’s salary history. “The problem of using prior pay to set salary is that women make less than men in our society, and so using prior pay institutionalizes gender discrimination,” Finberg says. In a similar but unrelated class-action lawsuit, Google is also alleged to have discriminated against conservative, Caucasian males such as plaintiff James Damore. Mr. Damore was made famous by a controversial memo he authored and distributed to his Google coworkers. He was since fired, and filed suit. In states like California and New Hampshire, employers are now required to give advance notice to employees on work schedule changes. California Law classifies obesity as a disability, given that its cause can be proven as physiological. Plaintiffs can file discrimination lawsuits on the basis of weight bias and classify the lawsuit as a FEHA violation. Elon Musk’s business The Boring Company is marketing and selling $500 flame-throwers. The flame-throwers are technically legal in California thanks to a loophole, so politicians are scrambling to ban them, fearing how they will be used by consumers. Mozilla Firefox is a trusted browser for many internet users, thanks to its policies against data-mining. The company is evolving to include features that suit the interests of its customers, but that requires the very data collection they assure their users they don’t practice. Firefox users are now doubting the company’s commitment to transparency. According to R Street’s Insurance Regulation Report Card, an annual look in to each state’s regulatory environment in the business of insurance, California received a D Grade (Rank #46/50). Vermont scored the highest with an A+ score. Cannasure Insurance Services is launching comprehensive insurance coverage programs for recreational and medical cannabis businesses in California. Big news for canna-businesses in the wake of recreational legalization. New Federal Electronic Logging Device (ELD) Mandates are being blamed for the rising cost in produce. The rules are widely unpopular in the trucking industry, though they were put in place to make highways safer. Cargo-theft numbers in 2017 were some of the lowest ever recorded, with a 12-percent dip from 2016’s numbers on stolen cargo and trucks, according to CargoNet.